Way back in August, just a few days before I was due to give birth to Little E, I sat at my computer and filled out an online form. I had heard on the grapevine that Quinny were looking for 25 people to test their new Quinny Zapp Xtra so I filled out the form and hit send. I never really thought about it again (well I did have other things on my mind - like giving birth and a DVT!) I just assumed that I had been unsuccessful. Then, at the end of September I received and email. "Congratulations! You have been selected to become a QuinnyCaster and test out the new Zapp Xtra!" By the time the Zapp Xtra arrived I was like an excited child. I couldn't wait to get the box open and put it all together. As part of our first QuinnyCasters assignment we had to do something fun surrounding the opening of the box... so we had Mister A dress up in his Superman outfit and filmed him putting it together! Now I know what you're thinking - a 3 year old cannot construct a pushchair - but he did a pretty good job and with a little bit of help and supervision from Daddy, it was easy. So if you are thinking about buying the Zapp Xtra then I'd say this is a definite plus point. When we got our first pram for Mister A (my grandparents bought us a Mamas & Papas Pliko Pramette) it took us about a week to work out how to put it together whereas the Zapp Xtra was surprisingly easy to put together. It only took about 5 minutes to construct. I'd never 'driven' a 3 wheeler before and I had a bit of a bee in my bonnet that I wasn't going to like it. I'm not sure why but thinking back this probably stems from my mother! When I was choosing my original pram 4 years ago my mum constantly told me how much she hated 3 wheelers (not that she'd ever used one) but it must have sunk in! In actual fact, having three wheels didn't really feel any different to me, if anything it was easier to manoeuvre and there is also the option of locking the front wheel - but I would never do that because that just makes things harder - does anyone actually lock the wheels on their pram? There is always the worry that any 3 wheeler is more likely to tip but I haven't experienced anything like that during my trial. 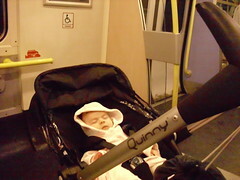 The Quinny Zapp Xtra is in 2 parts - the lightweight frame and the 'seat' (as I'm calling it) just clips on! To collapse the Zapp Xtra you need two hands!! You have to press 2 buttons on either side of the frame simultaneously to release the seat. The seat itself does not fold. The next step is to fold down the frame. You just press the round buttons on the side of the frame (again simultaneously) to fold the handles of the pushchair down and then you use your foot to collapse the rest. With a bit of practice it's fairly simple to do although not great if you have no where to put your baby! The moment I realised that the Quinny was in two parts when collapsed is the moment that a little bit of my love for the Zapp Xtra started to die. I have been so used to a 'one piece' pram that folds down 'in one go' that my heart sank when I realised that the pushchair wasn't fully foldable and that seat remained constantly 'open'. I just couldn't get my head round it and knew that if I had to fold it down whilst I was out for any reason - like getting the bus - then I would struggle to carry a newborn, and 2 parts of a pushchair. without even worrying about how I would fold it solo! Don't get me wrong it's fine if you are driving somewhere because you can take your baby out of the pushchair and put her in to the car seat before you fold it down but. In my opinion it's not great for newborns unless you are using it with the Maxi-Cosi seat and I wasn't. 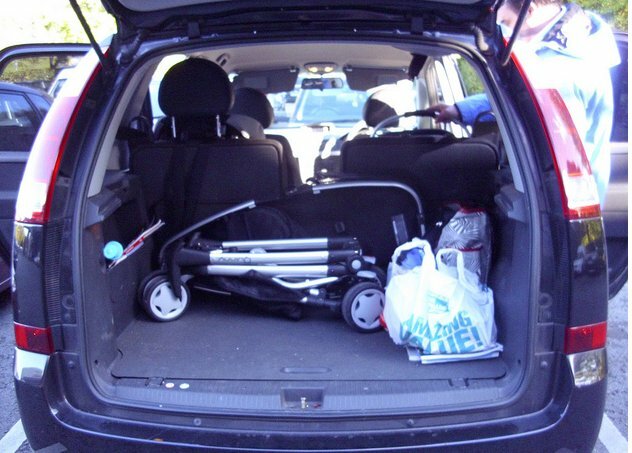 The frame of the Zapp Xtra is really small when folded and it does fit in the boot of my car and leave me plenty of room for my shopping as you can see in the image. It is also relatively light too and I love how compact the frame is. My fears about the 2 handed, 2 part fold eventually came to light when I headed to the Baby Show at Earls Court and I had to get the train from Liverpool to London. Unlike a normal train the Pendolino has no areas where you can sit with your pram up so you have to collapse it down and take a seat with your baby. Luckily I had my mum with me and she took charge of Little E whilst I stored the Zapp. It's impossible to fold the Zapp Xtra down whilst holding a baby - FACT. Had I been on my own I would have had to ask a stranger to fold it for me or even worse ask a stranger to hold Little E whilst I folded it down. Again, this could have been avoided if we'd have been using the Zapp Xtra with a Maxi-Cosi seat rather than the pushchair seat. I could have just un-clipped the seat from the base. Put Little E down in the seat and folded the base - easy! I should say that if you have a toddler then obviously they will be able to stand whilst you fold everything down so there would be no issues. I'm sure once Little E is old enough to stand public transport will be a hell of a lot easier! In all honesty I do prefer having a complete travel system when you have a tiny baby. If you go out for a day it's nice to have a big robust traditional style pram where your baby can lie flat and keep warm. I felt that Little E was a quite exposed in the Zapp Xtra as it's quite 'open'. I do, however, like that you can use it in either front or rear facing mode. The last thing you'd want is a newborn baby in a forward facing pushchair - that would be horrible. I felt that with Little E being so small and not weighing to much it made the Zapp Xtra feel a little bit 'rickety' I would imagine that once you have a heavier toddler in the pushchair it would feel a lot more sturdy. After a couple of weeks of dealing with my love/hate relationship with the Zapp Xtra I decided to give in and get a Maxi-Cosi car seat. I just hated the inconvenience of not having a travel system. If we were out and Little E fell asleep, I would always end up waking her when I was moving her from the pushchair to the car seat. As soon as I got the Maxi-Cosi, I fell back in love with the Zapp Xtra. For now I could head out with just the tiny little frame in the back of my car and just clip the Maxi-Cosi on when I reached my destination. It's so much easier now and if you are buying the Zapp Xtra for use from birth then a Maxi-Cosi car seat is a must have. The only down side to using the Xtra with the car seat is warmth and I'd suggest buying something like a Morrck Baby Hoodie to keep your little one toasty and of course the Maxi-Cosi Rain cover is a must! The Quinny Zapp Xtra is great for the school run or heading to the park but how does it fare when you head to the shops and you have bags to carry? In my opinion it's not the best. The basket underneath is tiny and is restricted by the central part of the frame cutting through it. When you are using the 'seat' rather than the Maxi-Cosi I found that access to the basket was quite limited. The structure of the frame means that there is a joint in the bar between the handles so you can't use an 'old school' bag hook like my mum used to in the 80's because it would weaken the frame. Similarly, Quinny do not recommend hanging shopping bags or even a changing bag from the handles as this also makes the pushchair unstable. Not one to adhere to rules I kept hanging my changing bag over the handles - it was rubbish though - the bag just slid right down. Eventually I made an amazing discovery - the Babymule changing bag - it has clips as well as a traditional handle and it means I can hang my changing bag on the the Zapp Xtra without it sliding right down. As far as shopping goes, I'd suggest taking a strapping young man out with you to carry your bags because the Quinny is no work horse when it comes to shopping! At 5 ft 4" I am relatively small and the Zapp Xtra's non adjustable handles are a bit of an issue. On previous pushchairs I have been able to adjust the height to allow for a comfortable mummy experience. Because the Xtra's handles are fixed, I find that I have to adjust my posture to enable me to be comfortable and therefore after about an hour of pushing I do get quite a sore back. The Sun Canopy is fabulous - not at all flimsy and it stays up when you need it to - something which I have previously struggled with and it has clear panels to allow your little one to see through the sides. The Raincover does exactly what it says on the tin. I found it easy to get on and off but it's not exactly easy to fold if it's dry and you're taking it out with you 'just in case' - in fact it will take up most of your basket! I think it's great that the Zapp Xtra comes with Maxi-Cosi Car Seat Adapters, I know that some brands charge around £30 to £40 for such extras. If you are using the Zapp in both car seat and pushchair modes then you'll need to ensure that you have the correct adapters with you. I left home in a rush the other week and ended up having to carry Little E around in her car seat because I still had the pushchair adapters on the frame so the car seat wouldn't fit. Finally, the shopping basket leaves a lot to be desired if like me, you use your pram primarily for heading to the shops. A Parasol (available in both Rocking Black or Rebel Red). Quinny also have a Footmuff available in a number of colours and we were fortunate enough to win one in a QuinnyCasters task. Little E was kept nice and warm in it and the inner lining is extremely soft. It is quite large for her at the moment so we're looking forward to using it next Winter when she's a bit bigger. Watch the Zapp Xtra Instruction Movie. 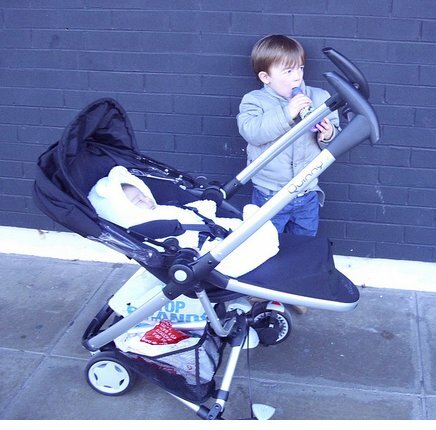 I can't tell you whether or not the Quinny Zapp Xtra is the pushchair for you - it has it's good points and bad points and whether or not it will suit you just depends on exactly what you are looking for in a pushchair. If you want a nippy and lightweight pushchair that's easy to manoeuvre then I can definitely recommend it. If you're thinking of buying it for a newborn then definitely get a Maxi-Cosi seat - you won't regret it. You need 2 hands to fold it. In 2 parts when it's collapsed. The good points are great but the bad points are bearable. So far I've had my ups and downs with the Zapp Xtra but I do love how easy it is to head out in a rush now that I'm using it with the car seat. I would definitely recommend it but if you aren't prepared to pay the extra for the car seat then I'd hang on to purchase until your child is able to walk. Ideally I'd like to be able to fold it using just one hand. A discount offer when you buy the pushchair with the Maxi-Cosi seat. That's all I have to say for now, I'll keep you updated on the trial as Little E grows!